The Cat Clicks: Snow World, Genting’s own Winter Wonderland! Dreaming of a White Christmas? Experience it at Genting's Snow World. It's an enjoyable attraction for kids and adults. Snow World at Genting recently renovated and is open now! Imagine playing in a cool -6°C 22.8k sq ft area. It is the biggest winter wonderland in Malaysia. For more information, please check their website. 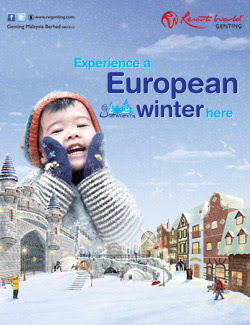 Have fun and experience the European winter!